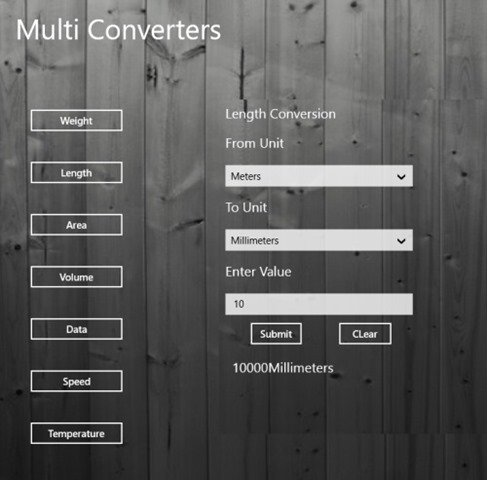 Multi Converters is a free Windows 8 unit converter app available under ‘Tools’ section of the app store. This unit converter app for Windows 8 lets you convert a wide range of units for common measurements. There are seven different unit conversion categories available including Weight, Length, Area, Volume, Data, Speed, and Temperature. The start page of the app comes with a complete list of conversions along with the converter. All you need to do is just choose a unit conversion ? select an input and output measurement and input a value that you want to convert ? once you entered all the boxes, now you can select on ‘Submit’ option to get the results. It’s a very simple unit converter Windows 8 app where you can easily convert values from one unit to another. Let me quickly point out the main features of this Windows 8 unit converter app below. Lets you convert a wide range of units for common measurements. There are seven different categories of unit conversion available including Weight, Length, Area, Volume, Data, Speed, and Temperature. It’s very simple to convert units using this unit converter. Well.. it’s a good utility Windows 8 unit converter app where you can convert values between multiple units. You just need to enter value and click on ‘Submit’ button. Also, check out our posts on Unit Converter Apps, and BMI Calculator Apps. Open this given link in IE10 and click on ‘View in Windows Store’. The app will now get opened in the Windows 8 app store from where you can install the app. In short, Multi Converters is a good utility unit converter app that lets you converter between different units of measurements, right in your Windows 8 screen. Go ahead and download Multi Converters app in Windows 8 now.